Dandelion "He loves me, he loves me-not." Folklore has an interesting spin on determining whether or not you are loved. 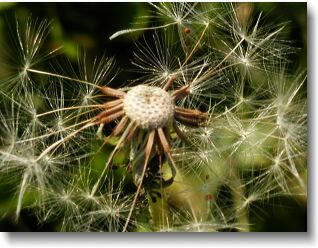 Instead of picking the petals off a daisy, try blowng the seeds off a dandelion globe. It's said that if you can blow all the seeds off with one blow, then you are loved with a passionate love. If some seeds remain, then your lover has reserveations about the relationship. If a lot of the seeds still remain on the globe, then you are not loved at all, or very little. Source: "Unusual Vegetables, Something New for this Year's Garden," Rodale Press Emmaus, PA. 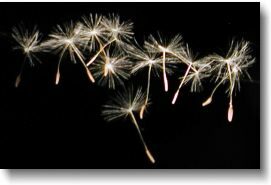 Telling Time with a Dandelion, aka "Clock Flower" or "Tell-Time"
Folklore says that blowing the seeds off a dandelion is said to carry your thoughts and dreams to your loved one. At least, so they say... Source: "Unusual Vegetables, Something New for this Year's Garden," Rodale Press Emmaus, PA.